Other than the nature of humans and of life, there is no existing paradigm for businesses and other organizations, technology, products, etc. that is necessarily right and thus should be aped. There almost never are any right or wrong answers for anything humans do, both at work and in the rest of their lives. Consequently, we must always question everything and take nothing to be truly sacrosanct. Given the current state of humanity, the most successful model for businesses & other organizations, technology and products is one that is largely utilitarian. As a creator of products and solutions, our focus should be on enhancing two dimensions relevant to humans – their productivity and their joy. Nothing else will attract a vast majority of humans. Last but not the least, we believe that a richer food of Thoughts is the richest food for thought. Do these assumptions resonate well with you? If so, go to T now at http://rftgyc.com to see the sort of magic that is created directly as a result of living life for nearly two scores of years without budging one bit from assumptions such as those listed above. Another senior official said Rajan’s criticism of rising intolerance in India was seen as direct interference in politics, complicating a decision on whether to re-appoint him. Rajan, who is on leave from the University of Chicago, had faced strident criticism from right-wing members of Modi’s Bharatiya Janata Party, including parliament member Subramanian Swamy, who has waged a campaign against his economic policies. “The government appreciates the good work done by him and respects his decision. Still, Rajan was known to have a good working relationship with Modi, who called the RBI governor a “good teacher” on economic matters, and officials had previously told Reuters that Modi’s administration would re-appoint the governor, should he wish to stay on. We must change the way people work. The first lady also has a strong interest in agriculture and even owns a block of rice paddies in Yamaguchi Prefecture. In T, several different types of summaries get generated for any content, such as the above news articles, that T processes. The 5-(T)hought summaries shown above are just one of millions of different possible summaries that can be generated easily in T for the same input content. Perhaps you now understand better why all T Drinkers I know drink T all day long & all night long. Who then do you think is smarter, a T Drinker or a non-T Drinker? Share your answer with the whole world. Do you ever search the Internet? Do you ever read a book? Do you ever think deep and hard about anything at all? Are you ever curious about anything at all from the past, in the present or of the future? Do you ever go out to restaurants to enjoy the food & drinks they serve? Do you ever troubleshoot a problem related to your work, your home, or your life broadly? Do you ever travel for business or for pleasure? Do you ever listen to the radio or watch television? Do you ever care for anyone or anything other than yourself? Do you ever attend public events or visit art exhibitions? Do you ever read a web page or a document in its entirety? Do you ever wish to be of assistance to anyone? Do you ever try to find out what is happening where you are or anywhere else in our world? Do you ever shop, offline or online, for your work or for any of your personal needs? If your answer to even one of the above questions is yes, you must drink T from now to eternity. Sign up for T or try T out at http://rftgyc.com Go there this very moment. This summer I had the pleasure of serving as a marketing intern for TipTop Technologies. As part of my job, I had the opportunity to work with TipTop Founder and CEO, Shyam Kapur, on upcoming applications, thinking of new applications, teaching others about how TipTop works and its functionality, and finally, getting the chance to present TipTop’s wonderful capabilities to a highly reputable university! I certainly learned a lot about not only marketing, but also the business of a startup and really what it takes to be successful and competitive in such a hot sector as data analysis. Yesterday, I asked Shyam if he could give me some more history behind TipTop and how exactly it became what it is today. After hearing the story, I can honestly say that I am very impressed and fascinated by how much had to be done in order to make TipTop what it is! TipTop started from Shyam’s research on natural language learning going back almost 30 years. This shows how much effort and thinking was put into the technology even before the first demo was built! Although the technology is quite remarkable, I was also very impressed by the business side of TipTop. As a marketing intern, it was my job to spread the word about TipTop through social media, word of mouth, presentations and any other possible means. However, the amount of marketing that occurred even before I joined TipTop was truly enormous and has helped get TipTop to where it is today. From finding investors and business partners, making presentations and, finally, convincing others that TipTop was truly beneficial required so much effort and dedication. Learning about TipTop’s past, present, and future plans has shown me what is necessary when running a business. As Shyam has told me, one has to be ready for setback after setback. Knowing this, I am now more aware and knowledgeable if I ever choose to start my own company sometime in the future! I truly had a wonderful time working with TipTop and would like to thank everyone, especially Shyam, for making my time so worthwhile. For now, I will be heading back to UCLA to continue my studies but am certainly looking forward to potentially continuing work with TipTop during the school year as well as next summer! Please continue to follow TipTop, as I will be, for more magical applications are coming out soon! 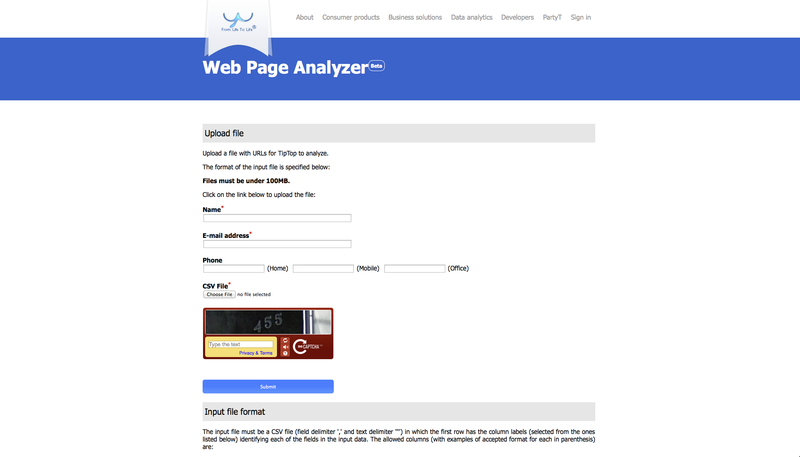 TipTop’s New Tweet Analyzer and Web Page Analyzer! Today, numerous users frequent multiple websites and social media sites, such as Facebook, Twitter, Instagram, and the like each and every day. Users post about everything from their favorite movies to the latest restaurant openings. The sheer amount of insights within data on websites and in social media is enormous. These insights can be helpful for anyone to leverage for their work and their life. However, how does, say, a restaurant owner, look at every review of their restaurant? How can they look at every tweet that someone has made critiquing this or that dish or the style of the restaurant or the cleanliness of the place? It is nearly impossible for a single human to read and interpret every single piece of information that could be relevant to their specific business or interest and then correlate all the findings fully. TipTop’s newly launched products, the Tweet Analyzer and the Web Page Analyzer, can help individuals & businesses accomplish exactly this amazingly difficult feat instantly! TipTop’s powerful data analysis engine reads tweets and web pages for both topic extraction as well as highly refined sentiment analysis. This way you not only know what any tweet is about but also the general feeling or emotion behind it! Both these interfaces are very similar and user friendly. First fill in all the fields you want including each required field, indicated by a red asterisk. 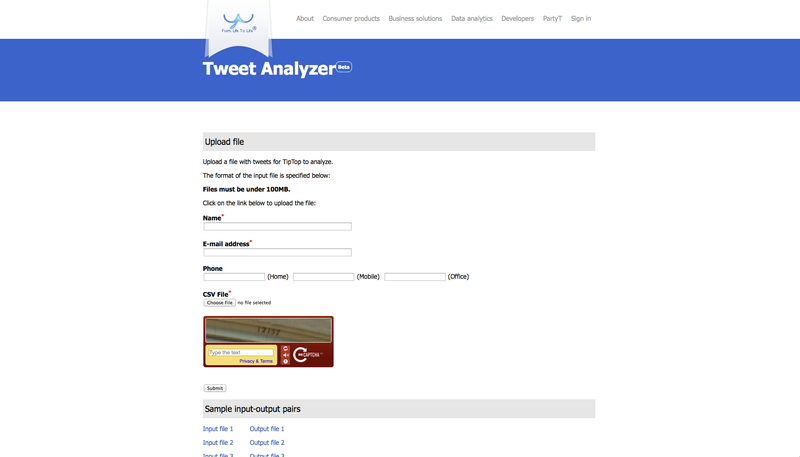 Make sure all the tweets or web page links you would like to have analyzed are stored in a CSV file. This will allow TipTop to easily read the data you input as well as generate an output file in the same standard format. Once you have created your CSV file, please upload it to either of the Analyzer Services by clicking “Choose File” and indicating the file’s location on your machine. Please also enter the Security Code to prove you are a human before you click “Submit.” Once this is done, you will be redirected to a page on Amazon.com so that you can make the required payment there. TipTop will then go straight to work analyzing the input data which could be either tweets or web pages. Once the processing is complete, TipTop will notify you at the email address you submitted. In the email message you will receive, there will be a link to the output file which has the results of the analysis done on your input data. Our Tweet Analyzer and Web Page Analyzer help both individuals and businesses find quickly valuable insights in their data so that they can act upon them promptly. We at TipTop hope that you will use our two services extensively as well as provide feedback as to how we can make them work even better for your needs. Also, be on the lookout for a variety of powerful products and services from TipTop Technologies that will be coming your way very soon! The Battle of Colleges – Who Wins? Numerous recently graduated high school seniors around the world have just finished the first leg in their academic journey and are now getting ready to begin the next: College. I’m sure many remember their last year in high school in, what I would deem, two distinct parts. There was the beginning of the year, the hard-working, I need to do my best this semester to get the best grades I’ve ever gotten to get into a good school, part of the year and then the latter, okay, I’m into college, let senioritis take over, part of the year. Let’s all try to forget the second part…and focus on the first part: the college search and application process. How do you decide where to apply? Do you follow the rankings? Which rankings do you follow? What do I even want to study? Is such and such a good school? These questions, among others, I can certainly say have invaded the minds of numerous college bound high school seniors and to be quite frank, there are no easy answers. There is so much to consider nowadays in your college search other that just academic reputation. To name a few that factored into mine: academics, reputation, sports, the weather, social life, clubs, the weather, job opportunities, location, professors, type of students, oh, and the weather. It’s often difficult to find out all the information you need to know about a college without spending countless hours driving to and from places, looking up different reviews online or scouring each college’s website. Now, don’t get me wrong, it is crucial to visit and research an institution to really know if it’s right for you. However, it is good to have some sort of central point to begin your search. TipTop is working on just that with its new application, Student T.
In the up and coming Student T application, TipTop will provide you with an in-depth analysis of any popular institution based on numerous online pieces of data including reviews, college websites and other such information. It can provide you with a categorical comparison of as many institutions as you would like as well as admission statistics and your specific chance of acceptance at these institutions based on previous admission history. Please take at a look below at our interface so far! Here we have TipTop’s new Battle of Colleges Widget. This application has the ability to take data on multiple colleges and then create categories on which to compare these colleges. This interface is very similar to TipTop’s previously launched TV Widget (Check it out here!) Just like the TV Widget, on the left, you will find each College or University being compared. Under “Select a college/university,” you are able to pick a college or university that you would like to learn more about. As soon as you start entering a specific school, the matching colleges or universities will appear right there in a dropdown list. You will find each category that TipTop has created on the top of the page and below them, the scores TipTop has given to the specific college or university. Scores that are above 0.5 indicate more positive reviews than negative for the school in a specific category, while those below 0.5 indicate more negative reviews than positive. A score equal to 0.5 shows that the number of positive and negative reviews were about equal for that category. Like the TV Widget, there are scroll bars on the top and bottom and left and right of the page that allow you to compare multiple schools at once as well as view all of their scores easily. In the above demo, the category, “education” is highlighted as the main comparative feature and this can be done by selecting “education” from the “to compare by” drop down menu on the top left. By clicking on one of scores, TipTop provides you with links and previews of different websites that discuss the college referencing that specific category. Just click on the small square box to the left of the description, and TipTop will redirect you to the site. Student T is still in progress, but we at TipTop are working to bring you this one-of-a-kind application soon to help all those rising high school seniors out! Check back for more updates soon!